Bernd Behr will present a group of loosely connected works including a new large-scale video projection depicting a series of uniform white concrete housing shells set amidst mounds of dug-up earth. Shot on the construction site of a new Bauhaus-themed gated community in China the piece chronicles part of a recent New Town development designed by Albert Speer Jr. Screened in reverse, Weimar Villa (Unreconstructed) depicts an endless cycle of construction and excavation. The initial documentary nature of the video soon gives way to more ambiguous readings where distinctions between the new and ancient are suspended. A series of sculptural works in concrete extend the archaeological motif of the video into the gallery. Leaning against the wall are a collection of individual flat panels of varying shapes and sizes. Their ambiguous forms, both hard-edged industrial and petrified organic, at once appear as both pre-cast construction components for some future, unspecified structure and archaeological relics of unknown origin. 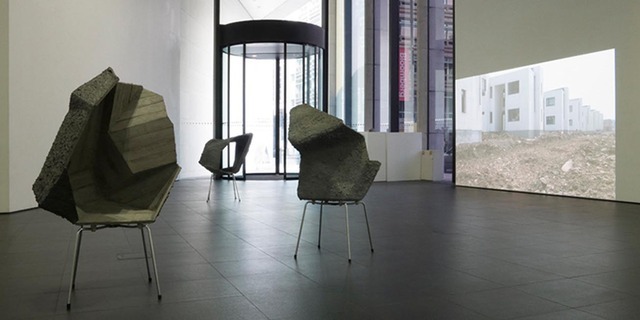 A further set of freestanding sculptures entitled Quasicrystal Compass consist of hollow crystalline shapes in concrete precariously supported by modernist Arne Jacobsen tubular chair legs. Rough cast from timber carcassing, their formal language is informed as much by late Modern ‘Brutalist’ architecture as the tradition of Chinese scholars’ rocks. This new work continues Behr’s interest in places and events that have shaped narratives around the history of the built environment. By inserting itself into these narratives using both research and fiction, Behr’s practice can be seen to operate a form of associative archaeology on the peripheries of architectural modernisms. Launched in March 2009, COMMA is a dynamic new series of commissions enabling artists to experiment and expand their practice in relation to Bloomberg SPACE and its communities. Over thirty of today's most outstanding emerging and established international artists will be invited to create new work, installations and architectural interventions in a fast paced succession of exhibitions. The program is curated by David Risley, Graham Gussin, Stephen Hepworth, Sacha Craddock and Vanessa Desclaux. For more information on one of the works featured in the exhibition, the film Weimar Villa (Unreconstructed), see http://ualresearchonline.arts.ac.uk/5584/.